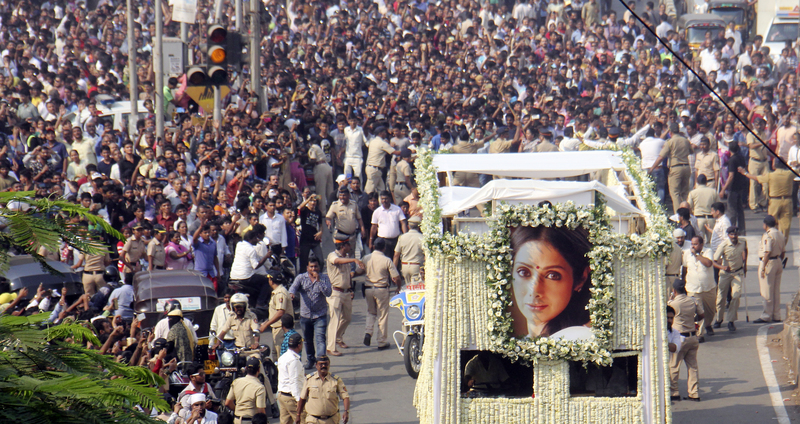 Thousands gathered today in the streets of Mumbai to mourn the death of one of Bollywood’s biggest stars, Sridevi Kapoor. The actress was cremated with full state honors after dying due to accidental drowning in the bathtub of her hotel on February 24th. Police reported Tuesday, February 27th, that the drowning was due to a loss of consciousness. The actress was 54. Best known as Sridevi, the Bollywood actress appeared in over 300 films throughout her 50 year career, which started at the age of four. Having mostly starred in Tamil films as a child, her breakout role came at the age of 20 when she appeared in one of Bollywood’s biggest blockbusters, Himmatwala, a complicated family drama surrounding a murder. Rumored to be the highest paid actress in her industry, Sridevi boasted charisma and star power after starring in classics like Mr. India, Chandni and Sadma. Although she took a 15-year hiatus in 1997 after marrying producer Boney Kapoor, she returned to the industry in 2012, making a huge comeback after starring in comedy-drama English Vinglish. She was also one of the few female Bollywood stars who could carry a big box office hit without the help of a male co-lead, and in 2013 the Indian government awarded her the country’s fourth-highest civilian honor, the Padma Shri. Countless Bollywood and South Indian film stars were in attendance at the late actress’ funeral, with crowds so massive that it took two hours for her casket to travel along the 7 km path to the cemetery. Sridevi leaves behind two daughters, a husband, and millions of fans.